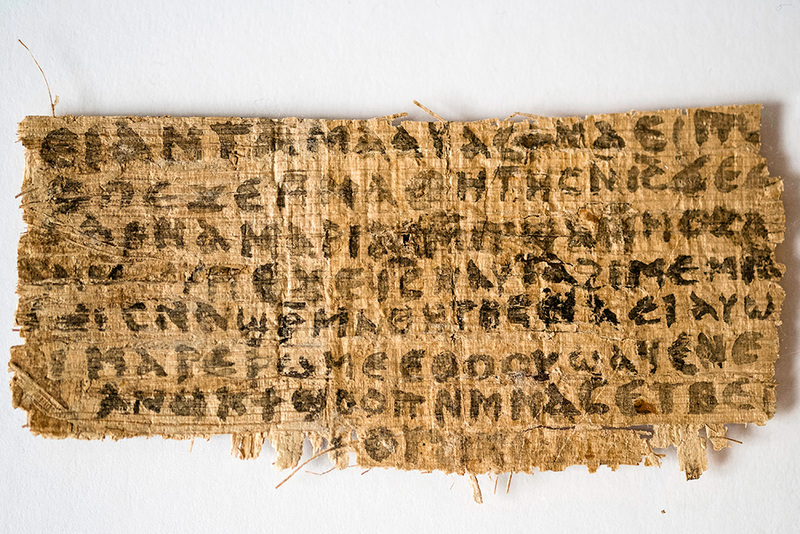 In Professor King's draft article about the poorly named Gospel of Jesus' Wife she discusses various features that persuaded her that the written text on the papyrus was ancient (here, from p. 11-12). On the other hand, there are a number of other facts that point toward authenticity. Most notably, it would be extremely difficult to forge the way the ink has been preserved on the writing material. As mentioned above, the ink on the verso has faded badly, an unfortunate characteristic shared with many ancient papyri, but an indicator of a long aging process. 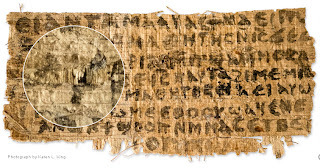 In addition, close examination of the papyrus under magnification and with the use of high resolution photography yields the following detailed observations that substantiate its genuineness: On the recto, tiny traces of ink from a preceding, but now lost, line can be seen on the small fray pieces of papyrus protruding from the top of the fragment. This suggests that our fragment has broken off from a larger page. 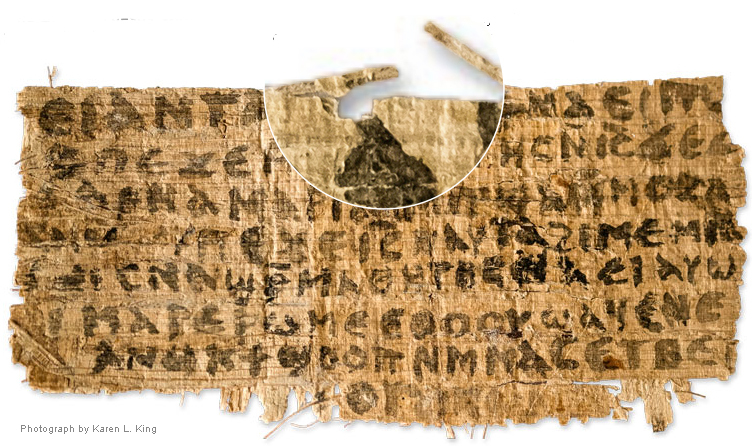 Moreover, in 3 →, dislocated fibers have obscured the first letter of the line due to damage of the material after the page was inscribed and this is again a common occurrence in ancient papyri. Also in 4 →, several letters have discontinuous strokes with missing ink because of damage to the material. For instance, the diagonal stroke before the pi (the remains of an upsilon?) 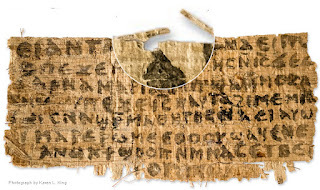 lacks its center where there is a small hole in the papyrus. And in that same line 4→, the horizontal bar of the pi of peje [PMH: sorry no font] is split. If this had been a forgery penned on an ancient, already damaged papyrus, these sections would have been filled with ink, but they are not. Thus, all these instances of ink preservation seem to indicate that the text was indeed written in antiquity. 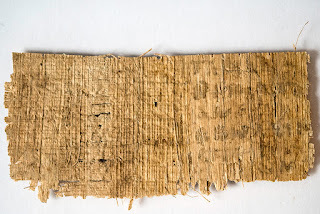 Furthermore, a hole in the papyrus where an insect had gnawed it after the ink had been laid strengthened the case for the fragment’s authenticity, as did the presence of ink on damaged, dangling strands of papyrus fibers at the edge of the fragment. “This is almost impossible for a forger to recreate,” says King. 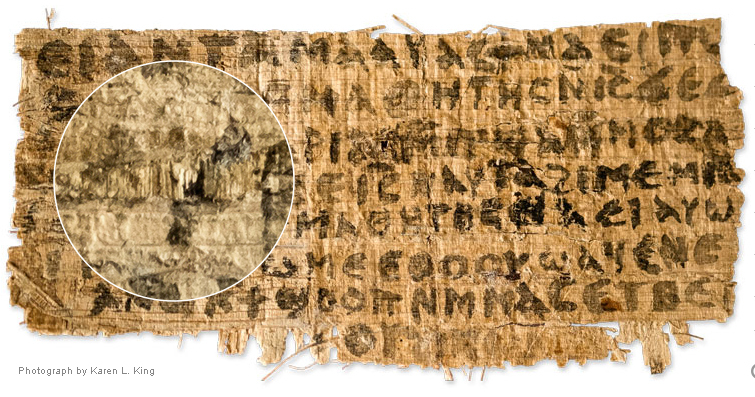 King says: 'On the recto, tiny traces of ink from a preceding, but now lost, line can be seen on the small fray pieces of papyrus protruding from the top of the fragment. This suggests that our fragment has broken off from a larger page.' (Draft, p. 11). BUT: I don't see it like this, and I think it reflects a misunderstanding of the situation. The top boundary has been cut, not broken (the sides and bottom have been broken, or at least not cut so cleanly - they have rather more shaggy edges); the small fray pieces have frayed subsequent to the cutting. These are not indications of ink traces from a previous line (and indeed, even if they were they would not be impossible to create in a forgery). King says: 'the ink on the verso has faded badly, an unfortunate characteristic shared with many ancient papyri, but an indicator of a long aging process' (draft, p. 11). Now, it is true that ink fades over time, but the amount of fade can't be correlated to a particular amount of time. It is all about exposure. And the real problem is that the ink on the back has not faded equally, most of the back has no evidence of ink at all, despite the fact that the vertical fibres are mostly present. (If there is any evidence of ink on the left side of the back of the fragment it would be in leakage through the gaps in the small section lacking horizontal fibres - but I'm not sure whether this is ink or shadow). King says: 'in 3 →, dislocated fibers have obscured the first letter of the line due to damage of the material after the page was inscribed and this is again a common occurrence in ancient papyri' (draft, p. 11). This would be a strong argument if it could be demonstrated that the damage/dislocation occurred after the ink had been applied (as King thinks). BUT a close look at the magnified portion suggests the opposite, since it is not clear that the ink of the alpha is underneath the fibres, and it looks very much like the fibres have caused a slight pooling of the ink at the bottom right hand side of the alpha. Of course there is only so much one can do from the available photographs. And questions about the antiquity of the text have been posed from many other angles in the last week or so. But it seems to me that these arguments form a very insecure basis for confidence in the antiquity of the writing. If a later forgery (whether modern or some centuries old), would it not also be possible that a genuinely ancient piece of papyrus with little or no writing on it might have been used to receive the current text? If so, what then really calls for investigation is the nature of the ink. What do you make of the spot on the first Epsilon of ⲉⲧⲃⲉ -- the last word on the last complete line of the recto. The ink appears darker on this spot and not obscured like I would expect. In other words, this Epsilon appears to have been written on top of the blob and not under it. It is an interesting blob of something (not sure what: in a normal ms I would think of wax dripped from a candle), and it would be nice to figure out how it relates to the writing. The bottom stroke of this epsilon is a bit unusual as it splits into two strands (unlike any other). This might suggest that the ink is on top of the blob (i.e. the blob explains why this epsilon is unusual). But I can't see that in the photos I have access to. Why do you think the ink is written on top of the blob? 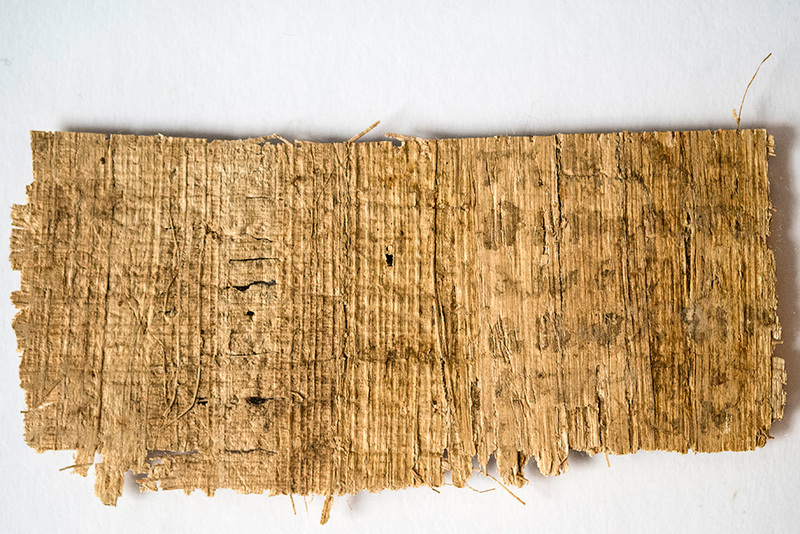 To me the papyrus itself looks legitimately old (except that it has been cut, I would suspect, with everyone else, that the cut is modern). If it is a forgery then either the back-story is true and it was forged in the 1970s or 1980s probably in Germany (perhaps as a playful piece of work among graduate students); or the back-story is also faked and it could be more recent (probably post 2005 when many papyrus texts began to appear on ebay) (with more of a money-making and perhaps ideological intent). If it is not a forgery then it is a pretty strange document, and could fit to some degree among the abnormal aspects of some other non-canonical gospel manuscripts. But of that I remain to be persuaded. Normally, when a transparent substance overlaps something, it obscures it and does not intensify it. If this organic material were on top of the ink, I expect that the ink would be less visible and not more. What are you referring to when you say, "could fit to some degree among the abnormal aspects of some other non-canonical gospel manuscripts." Perhaps, there is a Greek manuscript which I have not considered. In the Coptic tradition, I can not think of any parallel.